Wendell Dewitt Woodbury was born on August 14th 1901, in Meriden, New Hampshire to Ernest R Woodbury & Fannie L Gibson Woodbury, Wendell passed away on March 20 th , 1993 at the age of 92. 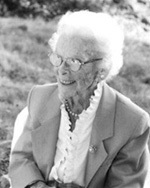 Evelyn Elizabeth Smith Woodbury was born on October 18 th 1909, in Jackson, New Hampshire to Clifton Vernon Smith & Mabel Elizabeth Johnson, Evelyn passed away on April 13th , 2010 at the age of 100. 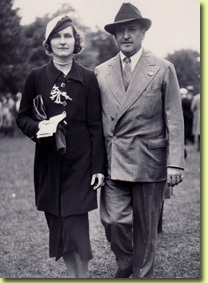 Wendell Dewitt Woodbury & Evelyn Elizabeth Smith Woodbury were dignified individuals who embodied the spirit of the age old adage of being a practical/frugal Yankee couple who had lived through the best and worst of times during the 20 th century. It is with this premise in mind that we felt it was appropriate to write Evelyn's obituary as a way to demonstrate her strong beliefs while she was alive as well as her and Wendell's forethought that they gave to their charitable giving prior to their passing. Evelyn and Wendell were unique individuals who were loved by all who came into contact with them during there long and successful lives. It is with great admiration that we continue to embrace Evelyn and Wendell's love for their community through their charitable giving which will continue long into the future. Sincerely: The Butterfield, Smith & Woodbury Families. From behind the breakfast counter at Hayes Drugstore in Portland , Maine , Evelyn Smith poured a cup of coffee for Wendell Woodbury, in town for a visit from his home in North Conway , New Hampshire . Evelyn -- the eldest of seven children, born in Jackson , New Hampshire on October 18, 1909 to Mabel and Clifton Smith -- had once worked for Mr. Woodbury as a caregiver for his ailing wife. When the woman improved, Evelyn was without a job and had moved to Portland to seek other employment. Years later, after Wendell's first marriage had ended in divorce, he remembered the spirited young blonde from Jackson . When he located her in Portland , Wendell began what he surely hoped would be a brief and successful courtship. But Evelyn was no pushover. It would take seven years of weekend visits - and several thousand miles on Wendell's car -- before Evelyn accepted his marriage proposal. On February 18, 1940 they were married at Wendell's uncle Harvey Gibson's house in North Conway; then known as the Moat View House, today the site of the Gibson Center for Senior Services. Following the ceremony, the couple embarked on a European honeymoon cruise, courtesy of the Gibson's upon the newly-christened ocean liner the United States . For Evelyn, raised in a family of modest means (like many families in Jackson, hers could not afford bus fare when Kennett High School opened, so Evelyn never went past the eight grade) an entirely new world was suddenly opened to her. In North Conway , Evelyn and Wendell settled into Wendell's Victorian-style house on Main Street , with its distinctive yellow clapboards and white gingerbread trim. The house was a gift from Harvey Gibson when Wendell was appointed his uncle's North Conway agent in 1927, overseeing the North Conway-born-now-youngest-Wall Street-bank-president's considerable holdings in the Mt. Washington Valley, including the Eastern Slope Inn, Mount Cranmore, a majority interest in the Carroll County Trust Company, substantial tracts of land, as well as other commercial and residential properties. The job came with the house, a housekeeper and an office with a secretary in the Gibson Block building next door. But upon their return from Europe, Evelyn immediately displayed her direct, hard working nature by promptly dismissing Wendell's beloved - but to Evelyn's thinking, now unnecessary - housekeeper. The Gibson's were impressed. This was no gold digger in their midst, but a strong-willed New Englander who couldn't conceive of the need for a hired housekeeper when her own hands and strong back would do just fine. When the United States entered World War II, Harvey Gibson was appointed the American Red Cross Commissioner to Great Britain . And in North Conway , Evelyn and Wendell sprang into action. Along with her best friend Thelma Carter, Evelyn worked diligently to organize and motivate local women for weekly Red Cross sewing sessions in a room in the Gibson Block to make gauze bandages for wounded soldiers. This experience would be the spark that ignited a strong philanthropic desire in Evelyn and Wendell. A tireless worker, Evelyn was employed at various Gibson businesses over the next thirty-five years, including managing the Eastern Slope Inn and working in the Cranmore Mountain Gift Shop. Throughout her life, Evelyn maintained an eagerness to explore new experiences, whether it was traveling the world, learning to golf with her dear friend Doris Hastings, or simply mastering the craft of knitting, producing dozens of sweaters and hats for friends and family, as well as newborns at Memorial Hospital , each with a small, distinctive tag identifying its creator. At fifty-seven, Evelyn decided she was long overdue for a driver's license and promptly passed her exam. Decades later and well into her eighties, she would routinely surprise her younger sister Elaine, a South Portland resident, with an 8:00 a.m. phone call from the Maine Mall -- ninety minutes from Evelyn's home -- inviting her on a shopping trip. In 1964, Evelyn took her life savings, $21,000, and bought her first stock, Esso Standard Oil, now Exxon Mobil. Over the next forty-five years, because of her keen judgment and frugal nature, combined with invaluable advice and assistance from her longtime financial advisor, Ted Gibbons, Evelyn built a considerable stock and bond portfolio. In the near future this will be combined with a trust established by her late husband Wendell, and will form the basis of the Gibson/Woodbury Charitable Foundation. Like her husband and Harvey and Helen Gibson, Evelyn never forgot her humble beginnings and her most earnest desire was to continue to enhance and contribute to her beloved community long after she had passed. 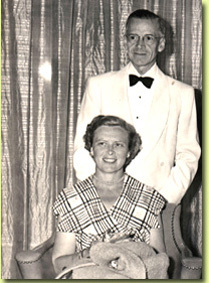 Evelyn was predeceased by her husband, Wendell Woodbury; her sister, Thelma Hodgkins; and her brother, Everett Smith. She is survived by two sisters, Myrtie Maynard and Elaine Farrugia; as well as two brothers, Clifton and Maurice Smith. Evelyn will be greatly missed by her surviving siblings, as well as her many friends, nieces and nephews, especially the Butterfield family of North Conway , who were her caregivers for many years. All residents of the Mt. Washington Valley can be grateful that Evelyn's love for her community will continue to benefit generations to come. She leaves a legacy of hard work, high ideals and a focused philanthropy that she directed be dedicated to children, education, community and the environment. Evelyn will be greatly missed and she and Wendell's generosity will forever be a part of the Mt. Washington Valley 's history. Funeral services will be held at the First Church of Christ Congregational in North Conway on April 17 th , at 11:00 a.m. with the Rev. Gilman E. Healy officiating. There will be no visiting hours. Donations in Evelyn's memory may be forwarded to Jen's Friends Cancer Foundation, P.O. Box 1842, North Conway , NH . 03860.